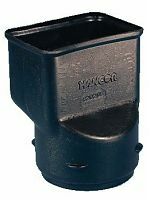 Our Most Popular tile adapter for 3x4 to 4" drain tile. The contractors choice to connect 3x4 downspout to 4" black flexible plastic drain tile pipe. Black drain tile adapters are compatible to the flexible black plastic drain tile (also known as elephant trunk). Downspout inside dimensions 4 1/4"x 3"
Pipe outside dimensions 3 3/4"